WordPress slideshow widget is an attractive way to show breaking or important news on your site. The widget is very configurable and the content for it can be included very easily. We used it on several of our themes, in example Hot Destinations (demo) and Hot Design Now (demo). On one side of the widget, there are a big picture and control buttons, and, on another side, there are heading, text, read more link and a small image. Everything can be done through the widget’s options panel. 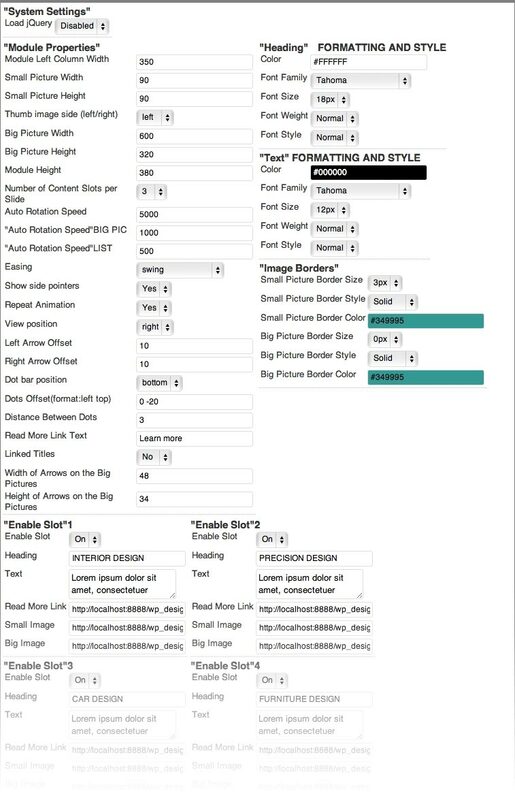 There are many parameters available in the WordPress slideshow widget settings, as you can see on the screen shot published on this page. You can control many things, including the widget’s dimensions (left and right side, and overall width), fonts (family, weight, style) of the headings and text, image borders, etc. The animation speed is also parametrized, so you can control up/down movements of the side column as well as the fade speed of the big image transitions. A small picture and a big picture. They can be different of course. Heading and intro text for each slide. Link to the full article, internal or external, if you want slide to be linked. Widget Text Column Width – Width of column with small images and text in pixels. Small Picture Width – Width of small pictures in pixels. Small Picture Height – Height of small pictures in pixels. Thumb image side (left/right) – Select whether to show small pictures left or right from the text. Big Picture Width – Width of big pictures in pixels. Big Picture Height – Height of big pictures in pixels. Widget Height – Overall widget height in pixels. Number of Content Slots per Slide – How many content slots to display per one slide. Auto Rotation Speed – Rotation speed in milliseconds. Big Picture Fade Speed – Fade transition speed of big picture. List Scroll Speed – Scroll (up/down) speed of block with small images and text. Easing – Animation easing effect. Show side pointers – Select whether to show side pointers or not. Repeat Animation – Select whether to repeat animation or not. View position – Select position of block with small images and text (left or right). Left Arrow Offset – Offset of the left arrow (on big pictures). Right Arrow Offset – Offset of the right arrow (on big pictures). Dot bar position – Position of bar with dots (top or bottom). Dots represent slots. Dots Offset(format:left top) – Enter dots’ offset from the left and the top in pixels. Distance Between Dots – Enter distance between dots in pixels. Read More Link Text – What text to show for read more links. Linked Titles – Select whether to make titles linked or not. Width of Arrows on the Big Pictures – Self explaining. Height of Arrows on the Big Pictures – Self explaining. Color – Select text color. Font Family – Select font family. Font Size – Select font size in pixels. Font Weight – Select normal or bold text width. Font Style – Select normal or italic text style. Small (or Big) Picture Border Size – Select size of border in pixels. Small (or Big) Picture Border Color – Select color of border. Enable Slot – Select whether to enable “slot” or not. “Slot” will not be shown until you enable it here. Heading – Heading of the “slot”. Text – Text of the “slot”. Read More Link – Enter link here if you need to. Small Image – Small picture of the “slot”. Enter full link to the picture. Big Image – Big picture of the “slot”. Enter full link to the picture.